You know you're a bit sick and possibly off your nut on cold and flu medication when you download a paint program for the first time. Damn I wish I had artistic skills. Or at the very least, more pseudoephedrine. It looks a bit like the Cheshire Cat, but less cheerful, and with a beans obsession. But what cat doesn't? I'm right there with ya! My brain is floating in Theraflu! Artistic skills are just that: SKILLS! And with practice, skills can be, well, if not perfected, at least improved upon! Talent, however, is a totally different thing. Talent comes from massive doses of 'Sudafed'. Think you could do a bit off good will whilst off your nut on cough medicine (like the best of us) and promote the Google 'Chrome for a Cause' campaign??? It's only on from the 15th - 19th of Dec and so many people follow you on this and twitter it would make such a difference. People can even uninstall it after that time if they really want. Hahahaha. I don't know why, but this just made my entire day. I think you need to frame that. At least put it on the fridge! Feel better, soon! Ah. I love a good Cold and Flu tablet trip. Nice work! It looks that you are highly expert blogger. 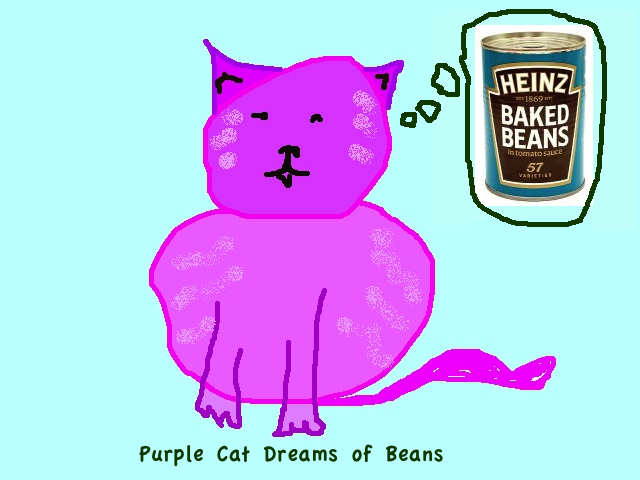 Let's get Metaphysical =P Why does the purple cat dream of beans? Is it the overall sensation of taste perceived by the cat as a result of eating the beans? Or is it the desire for something he cannot obtain... the urge to acquire that which cannot be provided simply because it's not meant to be? I like the cat. I hope you feel better soon. pseudoephedrine.. The lovely ingredient in all cold and flu meds that i'm mildly allergic too.. Makes me feel all woozy! I like your sites! Thanks for information.. I just want to say that you are amazing. I love your blog. I just started a blog of my own and I haven't got any followers yet but I hope to have as many as you one of these days. I'm fourteen and I'm pretty clumsy too. I hope you will never stop blogging. I check your website daily to see if you have posted something. I just love your blog. I'm sorry I'm gushing, aren't I. It's just I admire you so much. Check out my blog if you don't mind. I would love some constructive criticism. Thank you. I was going to send you an email but it wouldn't let me. i gotta say, I love that cat too! If you know hoow to make a Blog Button, that would be very cute! Hahahahaha! Awesome cat, thinking of beans,hmmmmmm. Interesting,lol!